Nomadic War Machine at Gilman! 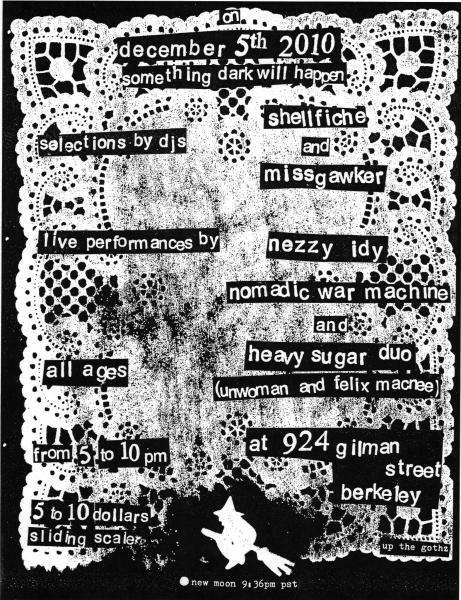 I’ll be playing my first show with my new music project, Nomadic War Machine, at 924 Gilman, the awesome, all-ages, volunteer run club in Berkeley that’s been around for almost as long as I’ve been alive. Hell yeah. It’s also my birthday. So… it’s my birthday, it’s my first show with my own electronica project (I’ve performed as a solo accordionist and as drummer for the band Ego Likeness, but never with my own projects), and it’s the first of what just might be many goth nights at Gilman. Also, I get to play with Heavy Sugar Duo (with Unwoman) as well as Nezzy Idy. Previous PostPhotos – Oakland to PortlandNext PostMusic video for Victimless Crimes! And my new album is done! Interesting they note the time of the new moon. Good luck by the way.